Tom Croat, P.A. 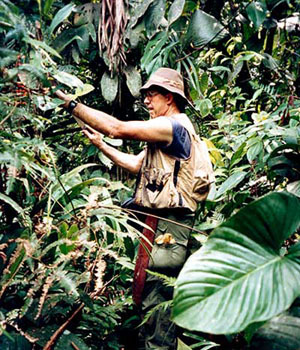 Schulze Curator of Botany, has made 85,000 plant collections in his 33-year career at the Garden. As one of the world's leading experts on Araceae, the philodendron or aroid family, Croat has collected more than 10,000 living plants and maintains the world's largest and most comprehensive collection of living aroid plants in the Garden's greenhouses. First, the truck broke down. Then the rain wouldn't quit, and the ruts in the road became deeper than the wheels. Then the heater for drying the plant specimens caught fire. For Tom Croat, it's all just another day at the office. He spends months each year in the tropics and has collected plants throughout Central and South America, much of the West Indies, Russia, Australia, New Guinea, the Philippines, Hong Kong, China, Viet Nam, Sabah, Sarawak, Java, Singapore, Thailand, India, Pakistan, Egypt, Kenya, Nigeria, and Madagascar. He is a taxonomist, a teacher, and a willing adventurer. Field research is gritty, sometimes risky work. Botanists navigate trackless wilderness, scramble up tall trees, and encounter disease and even armed guerrillas. But collecting and observing plants in the wild is the bedrock of botanical research, and the starting point of knowledge. "People are often amazed that we still don't know all the plants on our planet," says Croat. "Part of my job is to try to discover more of what's out there." The work of field research has changed little over the centuries. Today botanists may keep their notes on laptop computers and navigate with global positioning devices, but they still gather plant cuttings the old-fashioned way: placing them between pieces of newspaper and drying them in a plant press. As Croat says, "You have to get out there and keep your eyes open. You see how and where plants live, how they're affected by their environment, how they interact with other organisms. Every detail fills in another piece of the global puzzle." 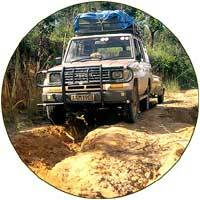 Botanical explorers in remote regions must navigate challenging terrain, often where no roads exist at all. 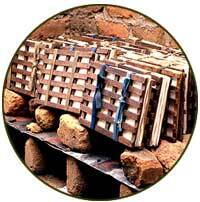 Plant presses drying over a primitive heater during a field expedition.